Finding out there is a leak in your home will always happen at the worst time possible. Have you noticed that? And when a leak gets going, it can cause problems for your quick – some of which can cause long term issues. If wet signs have led you to a leak in your home, act quickly and with purpose by following these steps. It’s great to feel self sufficient around the house, but it is rarely a good idea to get DIY when it comes to plumbing. A leak it your home can turn pretty serious quite quickly, so make sure calling a plumber is one of the first tasks on your list. They will be able to assess the situation immediately and work efficiently to stop the leak and mitigate the harm. 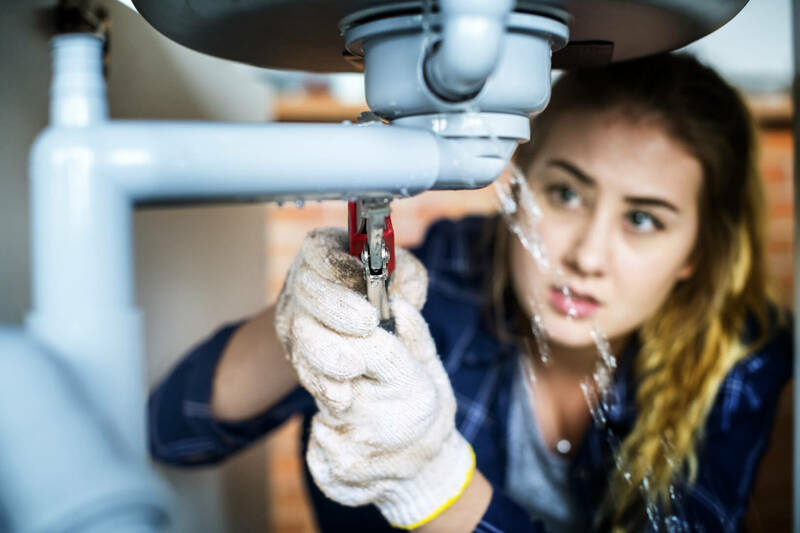 If you don’t already, it is good housekeeping to be in the habit of having a preferred plumber on hand so that each resident in your home knows who to call when these time-critical situations arise. This might be common sense, but not everyone thinks of this right away. They try to plug, stop or catch the water emitting from the leak, failing to remember that cutting off the water supply entirely is one of the best courses of action. You will need to locate the stop valve to do this, and if you don’t know where that is, you should familiarise yourself with its location as soon as possible. It is almost always in a room where water is used and most often on the ground floor. If you have an internal water meter, the stop valve will be attached to the pipe that is feeding into the meter. For renovated homes, don’t be surprised if your stop valve is in a cupboard or underneath the floorboard. If this is the case, keep tools on hand to access this valve when you need to. It is now time to limit the damage, and your diligence on this task will greatly affect the shape of your home. Turn off every single electricity switch at the fuse board, otherwise this will become an even bigger circus. Grab your faithful bucket and place it under the leak so your carpet or floorboards don’t damage, and also wrap a towel or thick cloths around the pipe to soak up the water and slow down the dripping and spraying. If your leak is still spraying with considerable force, you can turn on other taps around your home to distribute some of that pressure and take the fight out of your leak. These steps are nothing if you don’t learn what to do the next time, so you can act faster and reduce damage even further. Replacing carpet, floorboard and furniture simply isn’t worth the headache. Having your plumber weigh in on the situation, they will give you a snapshot of how this has happened and what steps you can put into place immediately to reduce this happening again. It may be that you need a pipe replacement, or it could be related to other plumbing issues with your shower, dishwasher, taps or toilet. Reduce the risk of future plumbing problems by getting a plumber in to see how things are running, and to determine the how and why these leaks are occurring. Time is not always on your side when these situations occur, and if they are not dealt with quickly they may become a more arduous and expensive project altogether, with far more than the pipes being replaced.